Astronomers have revealed that a nearby solar system has a planet that could harbour liquid water. 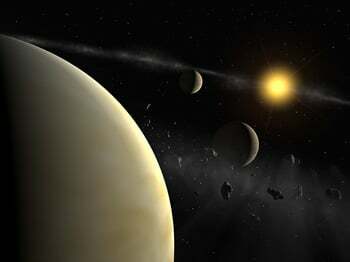 Techniques applied in the investigation have also made the search for more habitable planets easier. The snappily-named HD 69830 system is in the constellation Puppis, around 41 light years away. The Sun-like star has three Neptune-weight bodies orbiting it, ranging from 10 to 18 times the mass of Earth. The Switzerland-based researchers report in Nature that the two innermost planets are likely to be rocky rather than gas-dominated. The system also has an asteroid belt, similar to our own, between the inner planets and a third body. The outer planet is the most interesting in terms of life. The planets were found using the European Southern Observatory's 3.6m La Silla telescope high in the Chilean Andes. The planets were given away by the Doppler effect. When an object is moving relative to astronomers on Earth, Doppler shift changes the wavelength of light coming from that object. The movement of stars with planets is altered by them in a way which is detectable in their Doppler signal.